Three years. Three years since I reviewed a book on here. And the really shameful thing is that in that time, I have hardly read anything! Some plays and books for work, but not really very much in the way of things for myself. That is, quite frankly, a little embarrassing. However, I was bought this book for my birthday last week with the recommendation to read it before the TV series starts at the end of the month. In my haste to avoid spoilers at all costs, and to make sure I read the book before I watch anything on screen, I thought I had best give it a go. American Gods has a fantastic premise. What if all of the gods that had ever existed actually did exist? And what if they continued to exist to this day? What if the only thing that meant a god could exist was someones continued belief in them? What new gods would we be seeing formed before our eyes as we start to worship new things? Shadow is a prisoner who starts to find out the answers to these questions. Along with the premise, which is very much up my alley, Shadow is one of the best things about this book. He is a strong, silent type who comes across as highly relatable, despite being nothing like me, or probably you. He is the perfect connector between reader and story and goes a long way towards making the book a success. 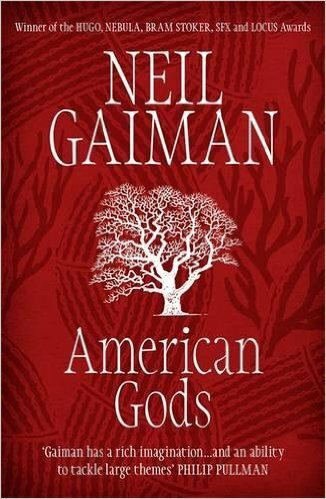 An interesting writing approach also comes in the way that Gaiman peppers the book with sub stories. We will occasionally take a small break from the main story to look at a smaller one in another part of America, or another time zone completely. Most of these have some relevance to the main story. Others just add depth and colour. I would often find this a little frustrating, but they are wonderfully written and one in the middle in particular – spanning an impressive eighteen pages – could work as its own novella. I urge anyone to read the book before they watch the film or TV version, and this is a must here. It is a brilliant read that I have gotten through in a few days, and considering I have been on quite the reading hiatus, that is an impressive feat. The trailer for the show looks good (and stars Ricky Whittle as Shadow, who, despite not being how I pictured him in my mind, had already struck me as the perfect choice), but nothing compares to reading first.